In my positive review of Moonrise Kingdom from two years ago, I lamented that something in me always “resisted” the films of Wes Anderson — even while acknowledging that I also liked most of them. I’m therefore happy to report that not only is The Grand Budapest Hotel my favorite Anderson movie to date, it’s also one that sweeps aside all of the prior reservations that I had about his work. While the director’s signature precocious “touches” are all over this (a confectioner’s approach to set and costume design, quick 90-degree pans from one perfectly symmetrical, planimetric composition to another, montage scenes accompanied by faux-Baroque music cues, etc. ), The Grand Budapest Hotel devises an ingenious narrative structure that for once completely justifies even the most fanciful aspects of Anderson’s mise-en-scene: the film begins in the present where a little girl is reading a novel that was written in the 1980s by an author who based his fiction on an ostensibly true story he was told in the 1960s by someone who knew firsthand the story’s hero whose real-life exploits took place in the early 1930s. Got that? The Grand Budapest Hotel is a story inside of a story inside of a story inside of a story — with the different “periods” represented being cleverly shot in different aspect ratios that correspond to how we think of movies from those respective eras (i.e., the square Academy ratio for the 1930s, widescreen CinemaScope for the 1960s, and “1.85:1” for the 1980s and the present). The true subject of The Grand Budapest Hotel then is storytelling itself, as it also is in Lars Von Trier’s Nymphomaniac Vol. 1 (another recent film that employs an elaborate framing device that calls into question the reliability of the narrator). 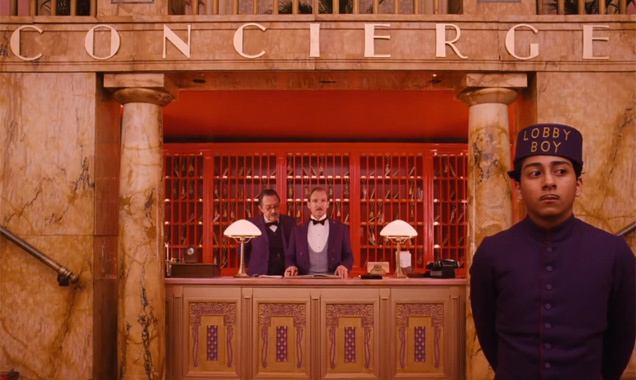 The Grand Budapest Hotel‘s chief narrative — a shaggy-dog story about a hotel concierge, one Monsieur Gustave H. (Ralph Fiennes), and his trusty “lobby boy,” Zero Moustafa (Tony Revolori), solving a murder against the backdrop of a fictional, war-torn European country — resonates through the decades like an absurd cinematic version of the “Chinese whispers” game. The other thing here that feels gratifyingly new is Anderson’s tone of moral seriousness: for all of the ridiculous humor on display (and Fiennes proves himself to be a surprisingly deft physical and verbal comedian), this tall tale grows not only unexpectedly dark but, as fascism ominously encroaches upon the characters, increasingly death-haunted as well. The protagonist of The Grand Budapest Hotel may be a rapscallion with an eye for wealthy older dames (by which I mean octogenarians) but he’s also a fellow of great integrity who understands what things in life are worth sacrificing oneself for. This moral-clarity-in-the-midst-of-screwball-chaos is finally what makes The Grand Budapest Hotel a worthy heir to the films of the great Ernst Lubitsch, its most important cinematic precedents. I can’t wait to see what Anderson does next. If, like me, you’re waiting with breathless anticipation for the forthcoming release of Richard Linklater’s Boyhood, which recently wowed critics and audiences alike at the Sundance, Berlin and South By Southwest film festivals, here’s another recent Linklater project you may not be aware of to tide you over: Up to Speed is a quirky travel show consisting of six half-hour episodes created by Texas’s favorite filmmaking son exclusively for the Hulu website in 2012. 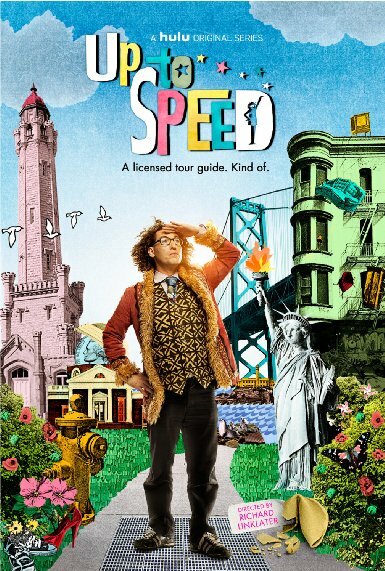 The premise of the show is that unconventional historian and motormouthed raconteur Timothy ‘Speed’ Levitch (still perhaps best known as the subject of the cult 1998 documentary The Cruise) serves as a tour guide of the “monumentally ignored monuments” of America’s greatest cities. I feel I would be remiss if I didn’t direct my readers specifically to the second episode in the series, entitled Chicago: To Conjure a Lost Neighborhood. This episode, which marks the first time Linklater has ever set down a tripod in my fair city, focuses almost exclusively on the history of Chicago’s considerable role as a leader in the national labor movement. Levitch, who dubs himself a “blue-collar historian,” recounts how Chicago, beginning in the late 19th century, had arguably the most organized labor force in the world and was instrumental in establishing such basic workers’ rights as the eight-hour work day. From there, Levitch — aided by a fair number of amusing “talking” buildings and props (not to mention snazzy animated graphics) — visits such important local landmarks and monuments as: the Haymarket statue, the Balbo monument, the former home of the Dill Pickle Club, and “Hobohemia” (home of both Bughouse Square and the infamous “Hobo College”). To watch Chicago: To Conjure a Lost Neighborhood is to learn some fascinating, lesser-known trivia about the Windy City’s radical past, as well as, I hope, to be inspired to fight the powers that be (as Chuck D would say) in the here and now. This entry was posted on Monday, April 7th, 2014 at 7:49 am	and tagged with Chicago: To Conjure a Lost Neighborhood, Richard Linklater, The Grand Budapest Hotel, Timothy "Speed" Levitch, Up to Speed, Wes Anderson and posted in Chicago Movies, Film Reviews, Odds and Ends. You can follow any responses to this entry through the RSS 2.0 feed. Certainly, The Grand Budapest Hotel is infused with the spirit and wit of Lubitsch’s films, but several films by Max Ophüls suggest a distinct influence as well, starting with the sensuous camera fluidity and movement that is the essence of Ophüls’ work. Plus, the film specifically credits as an inspiration the writings of Stefan Zweig, whose 1922 novella Letter from an Unknown Woman was filmed in 1948 by Ophüls. As I watched Anderson’s signature storybook-like mise-en-scène in The Grand Budapest Hotel, I could not help but think of the sequence in Letter from an Unknown Woman when Lisa (Joan Fontaine) and Stefan (Louis Jourdan) are seated in an amusement park’s faux train compartment as they travel the world via a changing panorama of painted backdrops viewed through the train’s windows. Finally, when Wes Anderson listed his top 10 Criterion Collection titles, first on his list was Ophüls’ The Earrings of Madame de … (1953)—to which the name of Tilda Swinton’s character, Madame D., is an unmistakable homage. Thanks for the comment, Renee. I absolutely agree with you that Ophüls is an influence here as well. I loved the “Madame D.” homage. Incidentally, I just showed LETTER FROM AN UNKNOWN WOMAN, one of my favorite films, in a class for the first time. Even though I’ve seen it many times, I feel like I really “got” it more than ever before. The film’s power lies in the discrepancy between how romantic the mise-en-scene is and how unromantic the story is: Fontaine’s Lisa is completely deluded through the whole movie! To paraphrase something Andrew Sarris once said about Hitchcock, Ophüls understood the importance of counterpoint in cinema. And just to bring this conversation full circle, Balaban (after appearing in MOONRISE KINGDOM and GRAND BUDAPEST HOTEL) is now a member of the Wes Anderson stock company. Glad you liked Grand Budapest Hotel. It’s possibly my favourite Wes Anderson movie so far and I think it’s his finest work. Like you I’m very interested to see what his next project will be! Great reviews. Thanks. I just checked out your own GBH review and certainly agree that it’s his finest film to date. Thanks for stopping by. Really looking forward to seeing what Anderson’s next project will be! On another note, I’m on the lookout for guest contributors at the moment, for a new blog series on favourite movies. It would be great if you’d like to take part, so let me know if you’re interested.